Nila Infrastructure is soaring high over 5% on early hours of trading in Indian bourses as recently the company has entered into 2 separate Letter of Acceptance (LOA) with Gujarat State Road Transport Corporation ("GSRTC") for the development of Bus Terminal under Public Private Partnership. One LOA is executed by the company for development of 'Amreli Bus Terminals and other LOA is executed in consortium with M/s Vyapti Infrabuilt Pvt. Ltd. for the development of 'Modasa Bus Terminal'. Although BSE Sensex is trading weak by over 185 points at 29300 levels. NIFTY 50 is trading down by 61 points at 9060 levels. 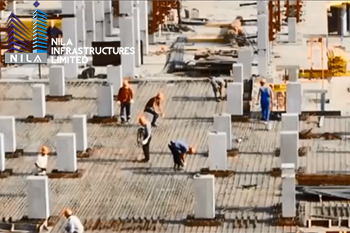 Nila Infrastructures Ltd is currently trading at Rs 17.1, up by Rs 0.85 or 5.23% from its previous closing of Rs 16.25 on the BSE. The scrip opened at Rs 17 and has touched a high and low of Rs 17.35 and Rs 16.8 respectively. So far 3471144(NSE+BSE) shares were traded on the counter. The current market cap of the company is Rs 639.26 crore. The BSE group 'B' stock of face value Rs 1 has touched a 52 week high of Rs 19.9 on 06-Feb-2017 and a 52 week low of Rs 10.25 on 24-Jun-2016. Last one week high and low of the scrip stood at Rs 17.6 and Rs 16.15 respectively. The promoters holding in the company stood at 62.05 % while Institutions and Non-Institutions held 0.19 % and 37.76 % respectively.